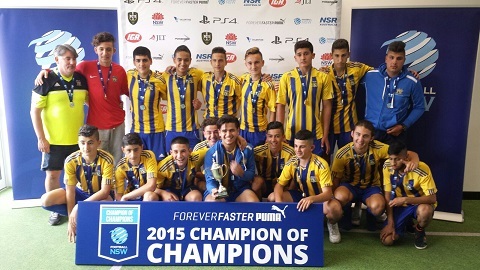 It is with great pleasure to announce that the Arnclffe Aurora U/15s are State Champions 2015 !! To the entire team, players, coaching staff, parents and supporters, AAFC would like to extend our utmost congratulations. You have made the whole community and ultimately the entire St George Football Association proud ! Your commitment and hard work throughout the entire 2015 season has been unmatched and evidently the result speaks for itself. You played a tough season in a very competitive competition which culminated in a grand final win which saw you qualify for the State Champion of Champions. Again you played in a very tough competition, playing at the top against champions from across the State, and again you proved that your competitive nature, your high spirits, your determination, your hard work and your team spirit in playing for each other and your club prevailed in achieving the status of "State Champions "
From all of us at AAFC, you have held our heads up high. NOTE if any Player get 9-13+ Weeks may include expulsion from club. dealt with on an individual basis. Arncliffe Aurora Football Club in the St George district. It is also solely run by volunteers. Committee members, coaches and managers do not get paid. Up to 30 volunteers contributed to the club’s success. There may be times when coaches or managers ask for your assistance. Please do not hesitate, step forward and lend a hand if you lke to help please let us know. IMPORTANT NOTE: Parents & Spectators MUST NOT enter the field of play under any circumstances (AAFC will be fined $500.00 for every infringement to this rule by the SGFA). Coaches/Managers may enter the field of play only after being signalled to do so by the Referee.